This Citizen Eco Womens is the best example of elegance. This is the very dial which is called as Mother of Pearl Dial. The dial is decorated with 28 crystals. 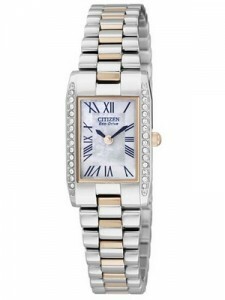 This Citizen Women’s Watch has the beauty of two tone color. Ladies go for shopping, parties and always too much worry about their look and appearance. They give so much importance to their jewelry and wearing. They think about the color combination and matching’s. The case and bracelet are made up of Stainless Steel. The bracelet has convenient Push Button Buckle. This watch has Eco-Drive Movement means it gets recharged by any light source, and you never need to change the battery. In solar watches, the light panels absorb natural or artificial light and convert it to electrical energy that runs the clock. This Citizen Eco-Drive Watch is a perfect women’s watch, and will always give an accurate time with caliber of B023.It gives warning when it has insufficient Charge and it also prevent an overcharging. This watch has time setting warning feature. The scratch resistant Mineral Glass is placed over the dial of this watch. This is not only protecting the dial but giving cool look. The white dial is easy to read and it has Roman Numerals to indicate the hours. This watch is water resistant up to 30 meters. Therefore no need to remove or take care of this watch even when you are at swimming pool or beaches. This watch is one of the best creations of Citizenwatch which is dedicated to woman. Buy Watch and stay away from the hassles of changing the batteries often. 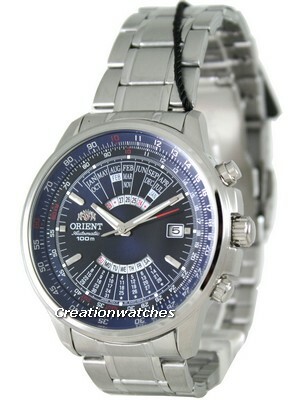 This watch is available for US $149.00 with us.